Application area Mi boxes are suitable for outdoor installation (harsh environment and/or outdoor). The material is examined and therefore qualified for the outdoor installation during direct sun radiation. However, pay attention to the climatic effects on the equipment. Resistant to occasional cleaning procedures (direct jet) Resistance to occasional cleaning procedures (direct rinsing) with high-pressure cleaner without cleaning additives, water pressure: Max 100 bar, water temperature: Max. 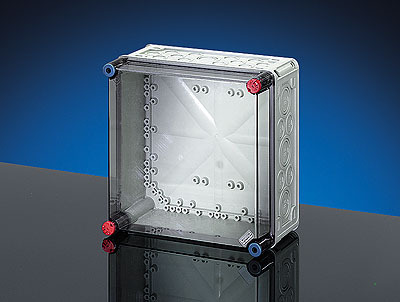 80� C, distance => 0.15 m, in accordance with IP 69K requirements, individual box without lid equipment (no box combinations), single enclosures without lid components (not any enclosure assembly), enclosure and cable gland at least IP 65. Note: Supplementing references regarding outdoor installation - harsh environment and / or outdoor: - The materials used for the Mi System are basically UV resistant, so that the mechanical resistance of the boxes is maintained during UV effect. Depending on the intensity of the UV effect e.g. transparent lids can become intransparent. - The top side of the boxes should be protected by a cover against weather influences such as rains, ice and snow. - Further on, also chemical influences have to be considered with the selection of the installation place - apart from the IP rating and climatic effects. - In order to keep the maximum permissible ambient temperature of the installed equipment as well as for the prevention from condensation additional measures as ventilation and/or heating may be necessary. To material properties see technical data.